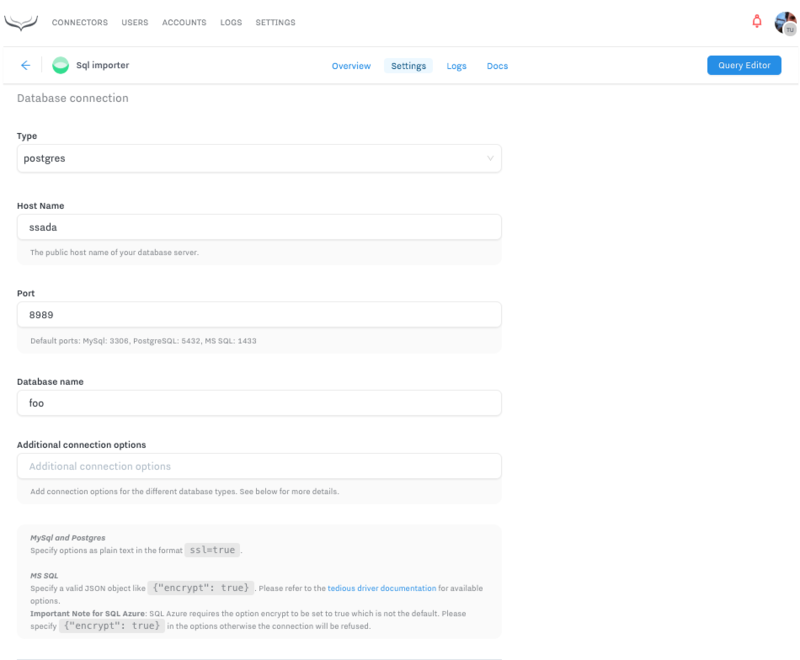 The Hull SQL Connector makes it easy to bring data from your SQL databases into Hull by writing your own queries. Go to the Connectors page of your Hull organization, click the button “Add Connector” and click “Install” on the Sql importer card. After installation, switch to the “Settings” tab and begin with the configuration. Click on the button “Preview” to check if your query is working and delivering the results you expect. Once you are satisfied with the result, save your changes. 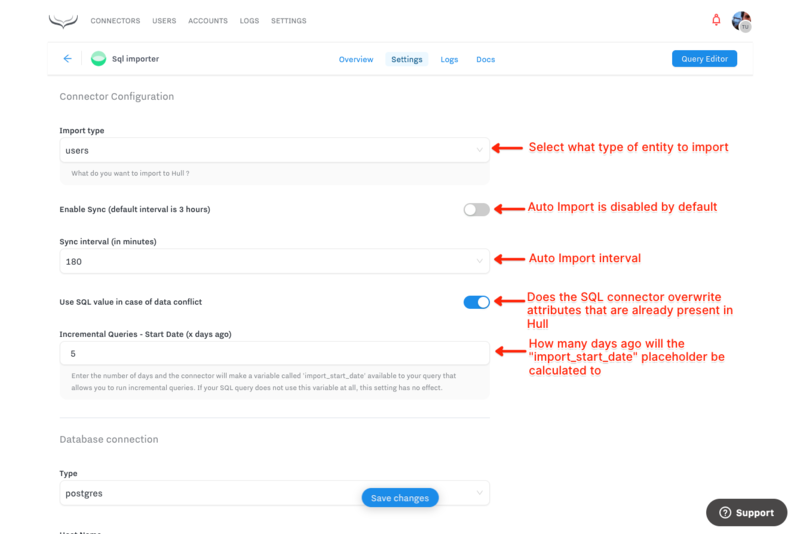 The SQL connector will run the query on a given interval (3 hours per default) once you enable the sync (see Synchronize data on a scheduled basis for further details). If you want to start the import directly, click on the button “Import everything” and we will get you going right away. You can bring in new entities or update existing user profiles from your SQL databases to create segments, transform and enrich customer data and send them to other services with our other Connectors. You can link Users to Accounts by exposing an account_id column in the results of a Users query, which will link the User to the Account’s external_id in Hull. You can import User Events and associate them to the Users in Hull by providing one of the identifiers. We don’t support Account events today. Valid queries MUST expose an external_id column matching a user’s external_id, an event column specifying the event name or type and a timestamp column. Lines with no external_id, event and timestamp will be ignored. All other fields will be imported as event properties. For example, the following query will map the column users.id to your Hull users’ external_id. If you import User Events, a best practice is to provide an immutable value for the Event’s id so that events aren’t duplicated. We strongly recommend you provide an event_id column to ensure event unicity. If you activate the Enable Sync checkbox, your query will run on a given time interval to import the data on a regular schedule. By default, the query runs automatically every 3 hours. You can select the interval here to balance performance and load. To increase performance we recommend to use incremental queries (see below). Note: If the Enable Sync checkbox is disabled, the query won’t run automatically (this is the default). 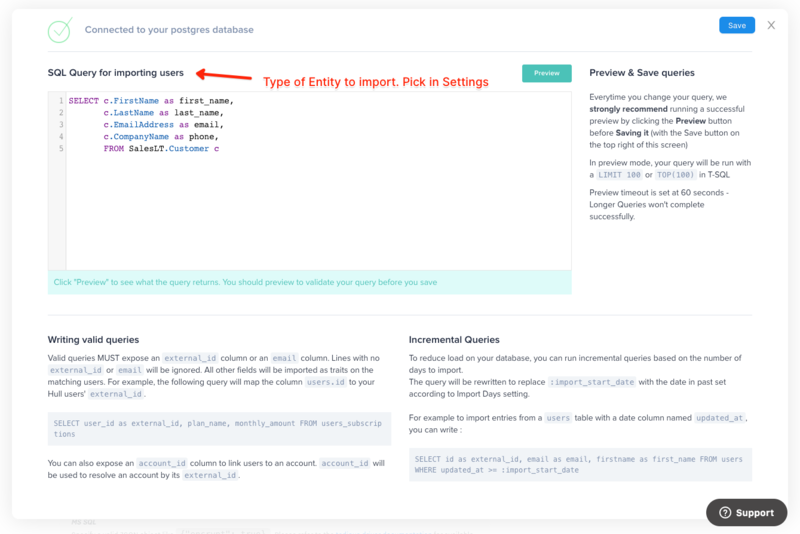 You can still run one-off imports from the Query Editor screen by clicking on the button “Import everything” after a successful preview. Note: The default behavior is to use the SQL value in case of data conflict. This is consistent across all connectors in Hull. If the tables in your SQL database hold large sets of data, you might want to query only data that has changed within the last couple of days - this is what we call incremental queries. The advantage of incremental queries is that you return a smaller subset of data that can be processed faster which improves the overall performance and reduces your number of Incoming requests. Please enter the number of days as integer or whole number. Fractional days are not supported. Please contact us if you need support for another database!